Klay Thompson is a complicated figure. 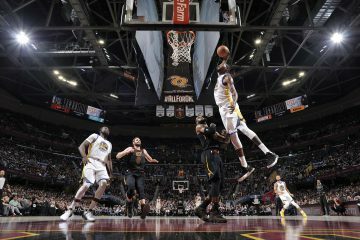 He’s not overly brash, he doesn’t show any signs of an inflated ego and his demeanor rivals that of Chief Keef (Reminder: http://bit.ly/11Liq5Y). Yet, while his shooting stroke and defensive prowess impress many, his inconsistency and turnovers highlight most of the discussion around the now third year guard. Thompson’s deficiencies — at least amongst the masses — are a cause for major concern. Many forget Thompson was in the midst of only his second season during the Warriors fascinating playoff run. There’s still plenty of room for growth. Thompson knows it, acknowledges it and plans to improve upon his already impressive skillset. While his charisma isn’t that of his fellow Splash Brother or All-Star power forward, Thompson’s importance to this team’s success nears both. With Brandon Rush out for all but 26 minutes last season, his name was called on for more than just his usual starting role. The third year guard from Washington State had his highs [Game 2 vs. DEN, Game 2 vs. SA] and lows [Game 6 vs. DEN, Game 5 vs. SA] this past postseason, but the potential for stardom is evident. Thompson has had two completely different seasons through the infant stages of his career. We often seek immediate impact and maximum results in relation to rookies and young players. 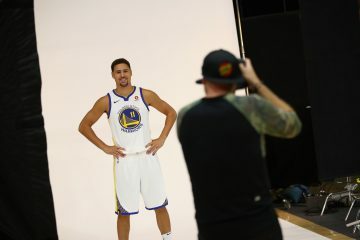 Thompson has been thrust into the starting role with the Warriors and has taken every opportunity to learn and get better from his unique situation. 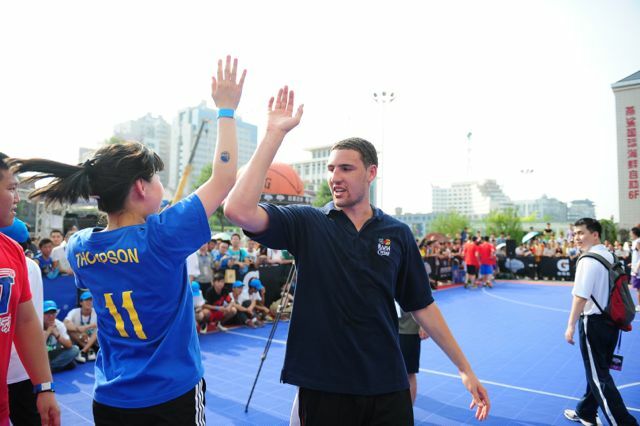 Thompson is currently in China promoting the Warriors preseason contests against the Los Angeles Lakers and NBA Nation. 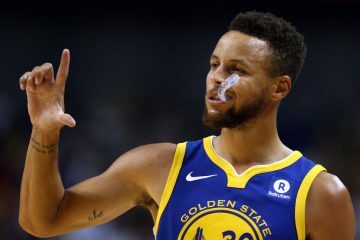 He was available for a short time Sunday morning to talk the Warriors playoff run, Mike Malone’s exit, what he wants to improve upon the most heading into his third season and more. How much are you paying attention to these Finals and what do you think of the series? I’ve been watching. It’s been fun to watch, these two teams have very contrasting styles. I’ve missed a couple games being in China. I called it going seven and I still think it’s going all the way. A lot of talk this series has surrounded Kawhi Leonard and his defense on LeBron James, as the Warriors can attest to that. What have you seen from Leonard and the Spurs defense in this series? I’m not surprised. Kawhi has great length, big hands and is a great all-around defender. The Spurs aren’t going to contain LeBron and D-Wade every game so you have to give him credit for what he’s doing. The whole team, it’s a team effort, they’re an older team but they understand the game so well and it’s a tough position to be in the whole time. They have each other’s back on the defensive end and that speaks to their chemistry. Kawhi’s a huge part of that and to be in his second year and be doing this is pretty amazing. You won 23 games in your first season, 47 games last season to go along with an impressive playoff run. Were you surprised at all how soon the team became successful with so many new pieces and given the struggles during your rookie campaign? Honestly, no. We didn’t have a full roster my first season and this past season we were really blessed enough that everyone was relatively healthy the whole year. I knew we had the talent and roster to do it we just had to come together as a team. That’s what we did. Everyone gets along, no one has a personal agenda. I wasn’t that surprised by it. To go to the second round with so many new guys, young guys, it was amazing. Hopefully next year we can go even further to the Finals. With exception of some short stints late in the San Antonio series, this last postseason run came without the help of David Lee. What can you attribute this success too? Our other guys stepped up, we didn’t get down on ourselves. Jarrett Jack played great in the playoffs, as did Harrison. Harrison, to be a rookie and do that is pretty amazing. Draymond, Festus, all these guys. It just shows that next year, with a healthy David and healthy Brandon Rush back we’ll be one of the deepest teams in the NBA. It’s going to be a lot of fun, we’re going to put a lot of work this summer and get better. It was tough, especially in that Spurs series when we didn’t have him at full strength because they have such a good frontline. He’s one of the best rebounders in the NBA and we missed him. 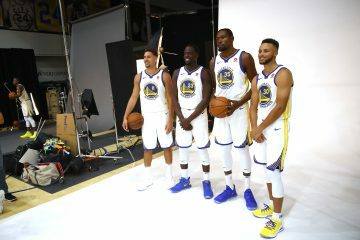 For next year, we’ll have a full roster: B-Rush will be back, whose one of the better shooters in the NBA and a great defender, we’ll have more depth in the frontcourt with Andrew, D-Lee, Festus, Draymond and Carl hopefully. We have a special thing going on here and I truly believe that. Jarrett Jack and Carl Landry are both free agents heading into the offseason [Landry has a player option for $4 million], what will the team lose if one or both are not back next season? Well it’s a business first, but I hope they’re both back. Two great guys, not even talking about basketball here, just great people to be around and two great teammates. Jarrett is obviously coming off one of his better years, he’s such a good scorer and great sixth man, he helped us get a ton of wins this year. Carl did too. I’m hoping we bring both back next season, they were so big for us this season. Both those guys have so much ability and they really improve our depth so much. When we go to that second unit we don’t even drop off at all. Some nights they even play better and pick us [the starters] up. I understand it’s a business but it will be huge if they’re both back. They were both so essential to our success this year. “Team chemistry” is often an overused cliché in sports, but I really thought this team had proved it true this past season. Both on and off the court, you guys really seemed to enjoy each other and thrive off that chemistry. How important is that togetherness to your success as a team? You look at all the great teams in the league and they all have great team chemistry. They all understand each other and go out for each other to win. They don’t go out just for individual numbers. That was a huge difference from last season to this season: team chemistry. Guys were really playing their roles and doing what was asked of them by the coaches. It was a lot of fun and the most fun I’ve had in my entire basketball playing career. It really carries back over on the court when you can get along off the court and have each other’s back. It really shows. We weren’t afraid to challenge each other. It was a ton of fun and hopefully we can keep the core together. Great chemistry carries over to every aspect of basketball and I really appreciated it. Heading into your third season, what are you looking upon to improve upon most this off-season? Offensively I just want to continue to get more comfortable. Putting the ball on the floor, getting in the lane and being more efficient around the rim. Absorbing more contact and making plays around the rim specifically. Defensively I just want to keep in shape, playing a lot of one-on-one against different guys and working on that. Staying sharp with that and working to become a better two-way player and not just become known as a shooter. But being more efficient around the rim and making plays most importantly. You mention finishing around the rim, how do you work on that specifically? You can do it during pickup in addition to working on that individually for an hour or two a day. Working on it individually then carrying that over during pickup. You have to get comfortable doing and take baby steps to work on that touch around the rim. Steph is one of the best in the game at it. He’s great with not only layups but floaters as well. Those situations happen almost every night so it’s something you have to put a lot of work in doing. Individually in the gym and with the help of other players, one-on-one and off-the-dribble. All that carries over. I’ve just been asked to do more. The assignments that I’ve had to do has changed a lot. My first year I wasn’t called upon to defend the better players or anything like that. My second year I felt I really got better defensively while trying to stop and slow down their better perimeter players, trying to contain them. I felt I got better at that every month of the season. Just trying to become the best two-way player I can be. The biggest leap was on the defensive end and hopefully this coming season I can do that on the offensive end. Any thoughts on what the Denver Nuggets have gone through this offseason? All this taking place after their first round exit at the hands of the Warriors. That’s just the business of basketball, I don’t take pride in that. They just ran into the better team and I honestly believe that. I think there was one game they outplayed us. We were so well prepared for that series and so focused. As for what has happened to them since, that’s just the business part of basketball: it’s cutthroat. They set a franchise record for wins and their coach can’t come back. It’s just all about winning in the playoffs. They felt they needed to make some changes. We just exposed their flaws in the first round. With Lee out, the team was forced to play a lot of small this postseason [Curry-Jack-Thompson-Barnes-Bogut specifically]. Do you like the prospects of playing more small lineups in the future? Harrison did a great job playing the four. In the Denver series that was Wilson Chandler at the four, a great perimeter player. I thought we countered that well with Harrison there. We adjusted well without having one of our better players and scorers. Extending four, four guys on the perimeter at one end, we have such good shooters that could lock in. It really hurts teams on dribble drives since they couldn’t leave their man open. Bogut did a great job at protecting the rim and a great job rebounding. It’s a fun style of basketball and fun for the fans to watch. Three rookies in the rotation and your All-Star going out, just speaks to our character this team has. We never gave up. It was a real special run and I hope we can do more of that in the future. How will the loss of Mike Malone hurt this team? Coach Malone has a great mind for the game. It’s a loss. We all wish him the best in Sacramento and he’ll have success there. He was great in developing talent. He just knew how to challenge us. He’ll be a great head coach. He’ll get Sacramento turned around. He did a lot of developmental things. He had great knowledge for the game. How did the Mike Malone/Mark Jackson dynamic work and what did Malone do specifically with this team? Coach Jackson was more of the motivator and would give a lot of suggestions on how to get shots off, how to defend guys and make plays. That’s the player in him, he’s been there so many times before. Coach Malone was great at drawing up late game plays, how to balance plays off the timeout and he was a really good X’s and O’s guy. He had a lot of tricks up his sleeves. Those elevator screens Steph and I ran through, that was usually always Coach Malone’s doing. He was a really smart guy and got us a lot of open shots from these plays. You were invited to the Team USA Mini-Camp this summer along with Harrison Barnes, this coming one year after you were on the Team USA Select Team. What are you looking to take from the upcoming camp? I’m just looking to get better. I got better from it last season when I played against the best talent in the world, now this summer I get to play against the best young players in the world. It’s pretty awesome for Harrison and I to be going together. We’ll both get better from it, I really believe it. It’ll be a lot of fun, I’m really excited to go again. It was a great experience last year. USA Basketball really took care of us. It’s an honor, it really is, not a lot of guys can do this. I get to try out for the future world teams as well and i got a lot of areas I can improve and work on in July. You’re in China for NBA Nation to help promote the NBA and the Warriors pre-season games vs. the Lakers in October. How has this experience been for you? It’s amazing. I didn’t expect to see so many basketball fans out here but they really love it. I’ve seen Warriors fans out here with Steph Curry jerseys. [Laughs]. It’s pretty sweet. I’ve had a ton of fun being here and It’s a whole different culture that I didn’t expect to experience when I was growing up. To be across the world and see that you’ve had an impact and people love the NBA is amazing. We’re coming back in October and I’m more excited for that because I’ll know what China has to offer.